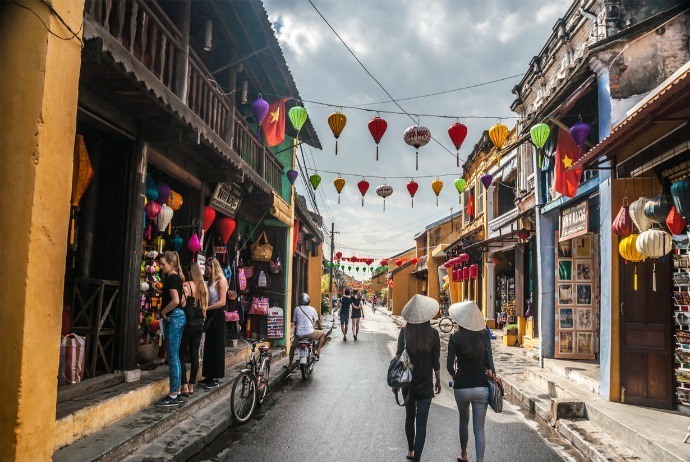 In addition to the cultural values through architectural diversity, Hoi An (Hội An) still preserves a quite bulky intangible cultural platform. The daily life of the residents with the customs, religious activities, folk art, cultural festivities with romantic natural landscape, specialty dishes … make Hoi An increasingly attractive foreign tourists. 1. What Is The Best Time To Travel Hoi An? The best time to visit Hoi An (Hội An) is from February to April annually, with less rain, and pleasant climate. You should avoid going in summer because of rising temperatures. The rainy season from October to November also has the disadvantages, such as heavy rainfall and high humidity. You had better visit Hoi An in the 14th or 15th in lunar month in order to attend the old town night. In this occasion, you will have a chance to witness the glowing red lanterns strung across the street, a typical scene of Hoi An in the holiday. 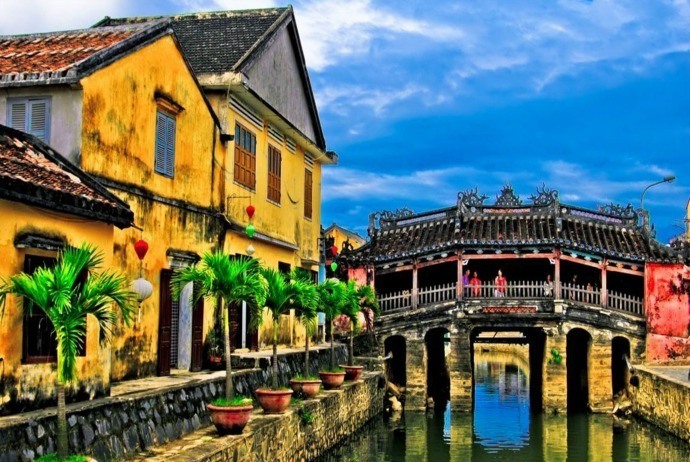 Hoi An is belonged to Quang Nam province, but the nearest airport is located in Danang (it takes about 30km from Hoi An (Hội An) to Danang (Đà Nẵng)). Nowadays, the airlines like Vietnam Airlines, Vietjetair, Jetstar, are all exploiting the routes from Ho Chi Minh (Hồ Chí Minh) City and Hanoi (Hà Nội) to Danang (Đà Nẵng). 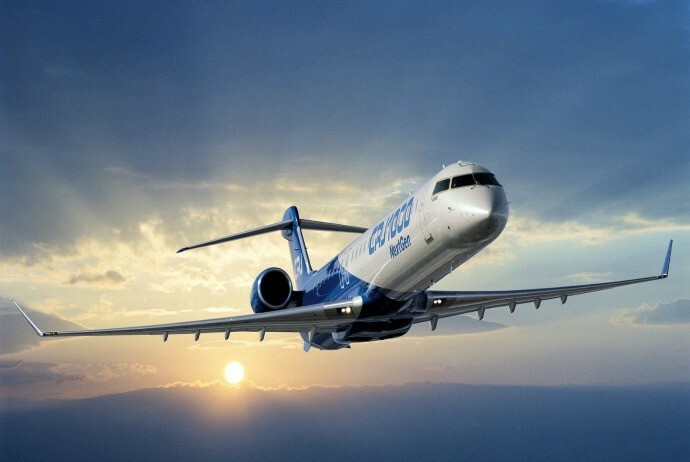 If you want to buy cheap airline tickets, you should reserve from 3 to 6 months in advance. From Hanoi to Saigon: there are trains to Danang (Đà Nẵng) (North-South route), the ticket price ranges from 400,000 to 1,200,000 depending on the type of train and seat. It takes about 14 to 20 hours to travel from these two cities to Danang (Đà Nẵng) by trains. Coach: it costs VND 400,000 – 500,000 to travel by cars, with the famous agents as Hoang Long (Hoàng Long), Hlink, Mai Linh, Thuan Thao (Thuận Thảo). It takes 18 to 20 hours from Hanoi (Hà Nội) / Saigon (Sài Gòn) to Danang (Đà Nẵng). Because the transit point to Hoi An is mainly the pier and car from Danang (Đà Nẵng). From there, you can take the bus or taxi to Hoi An very conveniently. Cau Bridge is the jewel in the heart of Hoi An. Built in the late of the 16th century, this bridge is called as Japanese bridge. In the middle of the bridge, there is a small temple worshipping Huyen Thien Dai De (Huyền Thiên Đại Đế). The bridge has a unique roof with the texture and decoration representing the harmony between the architecture styles of Vietnam, China, Japan, and Western. 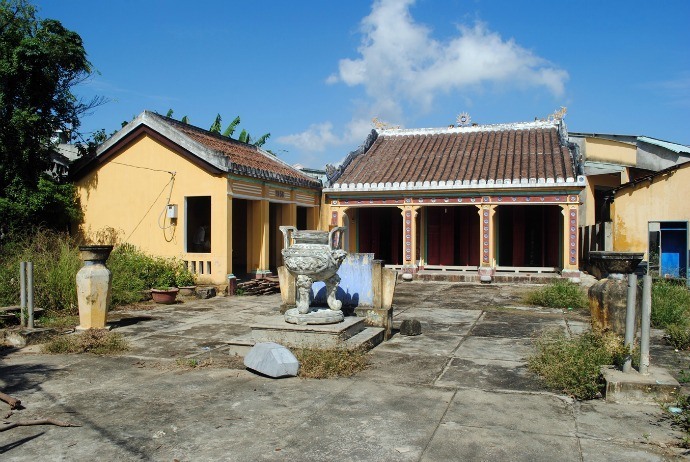 According to legend, the predecessor of the Assembly Hall is a small temple worshipping the Thien Hau Thanh Mau (Thiên Hậu Thánh Mẫu) statue (the god bless for traders involved with the ocean waves) rescued off the coast of Hoi An in 1697. Through a few times of restoration, with the main contribution of the Fujians, this Assembly Hall has become more and more vibrant, spacious contributing to the architectural embellishment of Hoi An. Built in 1845, this Assembly Hall worships the three Ma Yuan (Mã Viện) tycoons – the god good at taming the waves helping the traveling on the sea be smooth. The hall has special values in terms of architectural structure with the finely carved wooden frame, the decorative wooden altar, and others. Established in 1885, Guangdong Assembly Hall initially worshipped Thien Hau Thanh Mau (Thiên Hậu Thánh Mẫu) and Confucius (Đức Khổng Tử), but after 1911, it turned into worshipping Quan Cong (Quan Công) and Guangdong’s ancestors. The rational combination and usage of wood and stone in the bearing structure gave this Assembly Hall imposing beauty. Annually, on Nguyen Tieu (Nguyên Tiêu) day, (June 24 according to Lunar Calendar), there is a festival celebrated here, which attracts a lot of participants. 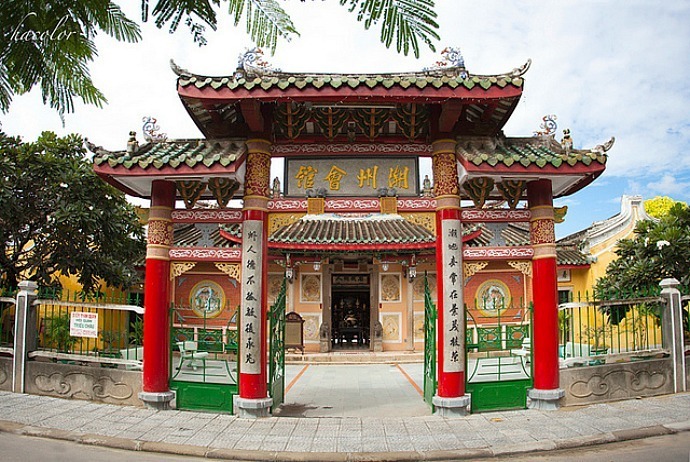 Established for worshipping the family ancestors, Tran (Trần) Family Chapel is built in 1802. The architecture of this building reflects highly the influences of Chinese, Japanese, and vernacular styles. In detail, the central door is reserved for the dead. On 11 November each year, the death anniversary is celebrated for the main ancestor. In traditional beliefs, women will enter from the left and men from the opposite, despite these distinctions seem to disappear nowadays. Situated on an area of 1,500 m2, inside the chapel, there are wooden boxes on the altar containing the stone tablets of Tran ancestors, with chiseled Chinese characters setting out the dates of birth as well as death, plus with a few small personal effects. It is said that one the anniversary of the death of each family member, their box will be opened, food is provided and incense is burned. When visiting this chapel, after a quick tour, you will see the “antique” room in which there are lots of coins for sale, and another room which has full of souvenirs for sale. 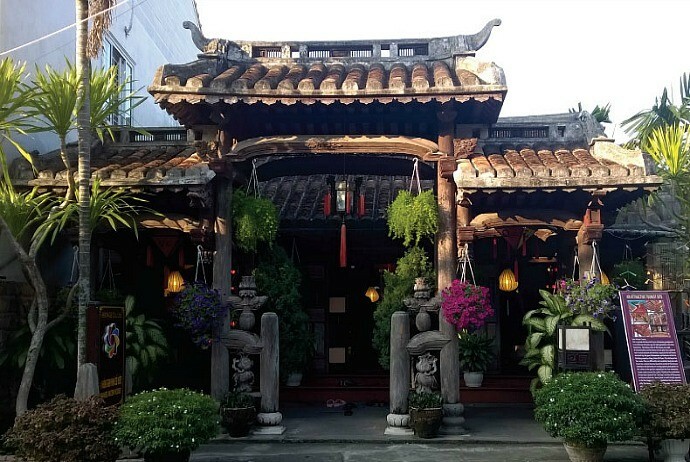 Built nearly 200 years ago, Tan Ky ancient house has a typical architectural style of Hoi An with the interiors being divided into many apartments and each one has its own function. The house has a large wooden door, but no window. There are two wooden bolts above the door, carved with the yin-yang symbol. Chinese poems were described in mother-of-pearl hanging from a number of columns which holding up the roof. The house’s back door overlooks a wharf by the river that was extremely convenient for loading and unloading goods. There are four rooms in the Tan Ky Old House. All of them are small in size, yet packed with different beautiful antiques majorly made of wood. These rooms have different purposes: one for welcoming Chinese merchants, the second is the living room, the third serves as a courtyard and the last is the bedroom. Tourists could enter all of these rooms, except for the bedroom. You should look for a tour guide who can offer you interesting details of the house. The workshop brings together most of traditional handicrafts of Hoi An and Quang Nam, such as pottery, weaving, lacquer… Visiting the workshop, tourists will find a quiet, peaceful setting of a Vietnamese village, witness by themselves the skillful hands along with great skills of the artisans, creating exquisite and unique handicraft products. Tourists could also take a few steps in the manufacturing process of these fields and buy some products as souvenirs. This is a beautiful beach with white sand, clear blue water, small waves and fresh seafood restaurants with cheap prices. Visiting the beach in the evening is also excellent and because at that time, the beach is vast and shimmering under the romantic oil lamps. 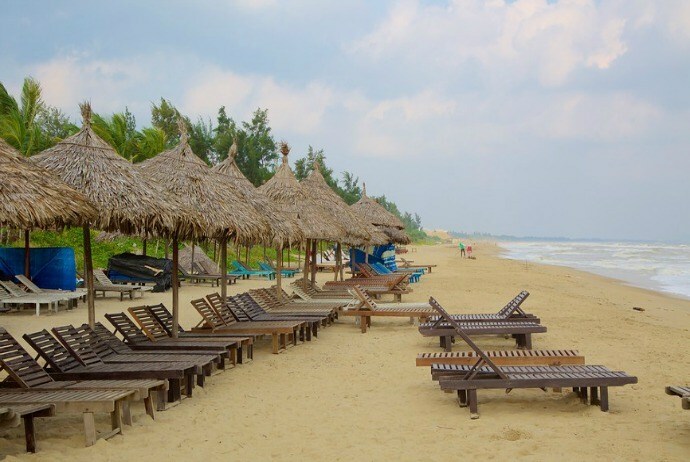 About 4 km away from Hoi An old town, and 30km from the international airport of Danang (Đà Nẵng), An Bang Beach is one of the most ideal places to lay your hat. Go to this beach, you will feel the wonderful fresh when walking along the sand, pick up the rising sun, and watch the pristine beauty on the sea at dawn. Because the coastal erosion has recently become a big issue at Cua Dai Beach, An Bang Beach now plays the role as the major beach of Hoi An. 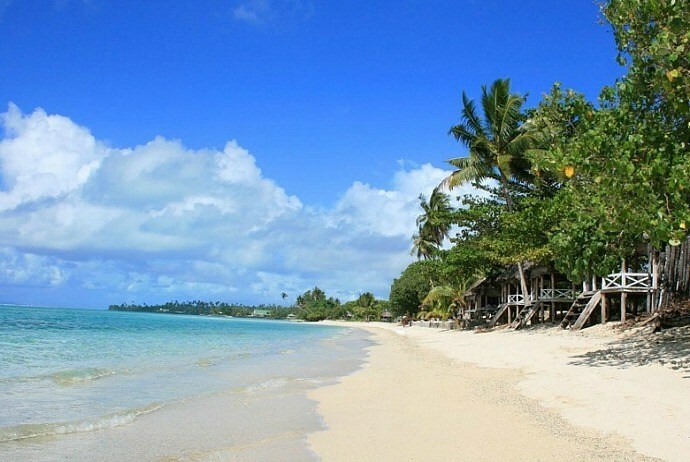 This beach is popular all year round with both local people and travelers alike. During the summer months, domestic tourists come here for sunrise swims and sunset barbecues, meaning that it is quiet during daytime. From March to September, the beach has the temperature soaring in to about 30s and beyond. If beach lounging and tanning are your favorite, then you could hire a sun lounger with the price of a water bottle for the day. Thu Bon River, one of the most beautiful waterways in Vietnam, starts at an altitude of 2,598m in Ngoc Linh (Ngọc Lĩnh) Mountain. 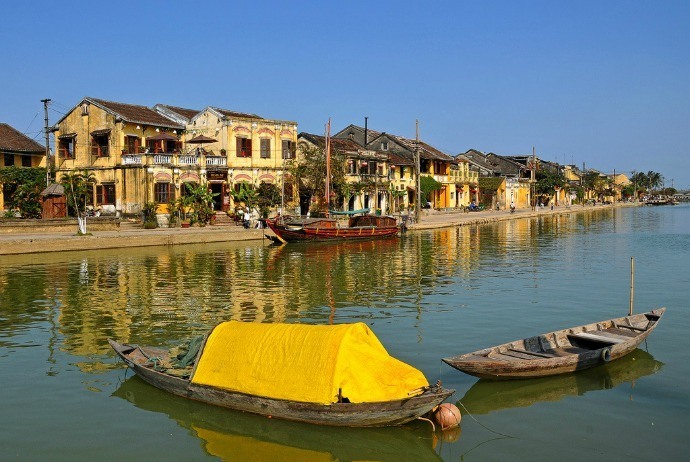 This river plays a crucial role in the geography, history and culture of Hoi An. Furthermore, it is not only the culminating point for the majority of events and festivals held in Hoi An, but also the main source of livelihood for a lot of people of the town. Today, the remains of the ancient port as well as the picturesque waterfronts could be seen along this river. You can take part in a boat tour along Thu Bon River. Two sides of the river, there are beautiful sand dunes and picturesque farm and mountain scenes. Particularly, the sunset on Thu Bon River could make all tourists impressed. From Hoi An, tourists could rent a boat and stop at the nice villages situated along this river. 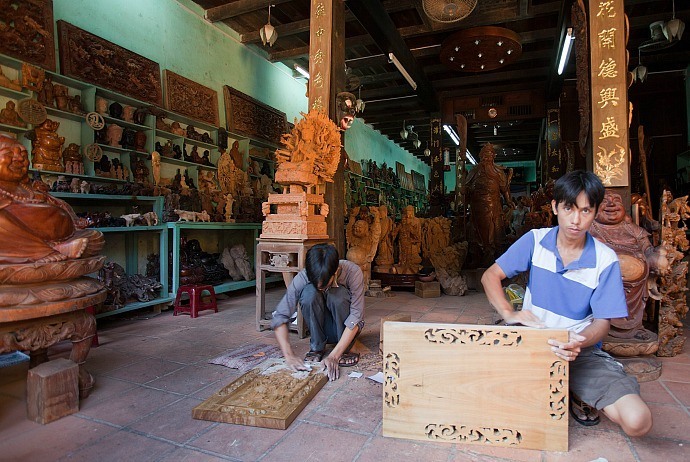 Artisans at Kim Bong carpentry village used to boast to his ancestors that they were invited to the capital of Nguyen Kings to construct and restore the palaces, works and mausoleums. Visitting this village, tourists will witness the procedures of manufacturing many sophisticated art products. Location: Located in Cam Kim (Cẩm Kim) commune, opposite the old town of Hoi An (Hội An), across Thu Bon (Thu Bồn) River. From the old town wharf, it just takes 10 minutes to get there by boat. 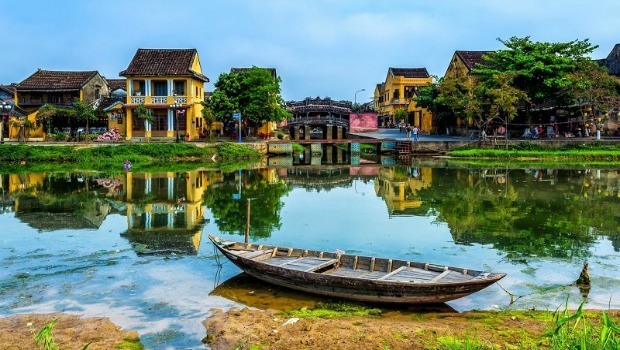 Situated by Thu Bon (Thu Bồn) River, Cam Ha (Cẩm Hà) Ward, Quang Nam (Quảng Nam) Province, about 3km to the west of the old town of Hoi An, Thanh Ha pottery village is a renowned village having a long historical legacy and used to play a crucial role in Hoi An old town’s development. The pottery products of this village include animal shapes, jars, pots, bowls, in different forms and colors. They are lighter than the same products in other places. Despite they have experienced many challenges overtime, foreign competition, economic difficulties; the locals are still trying to preserve their traditional profession, inherited from their respectful ancestors. They use unique techniques which are different from those prevalent in other places. 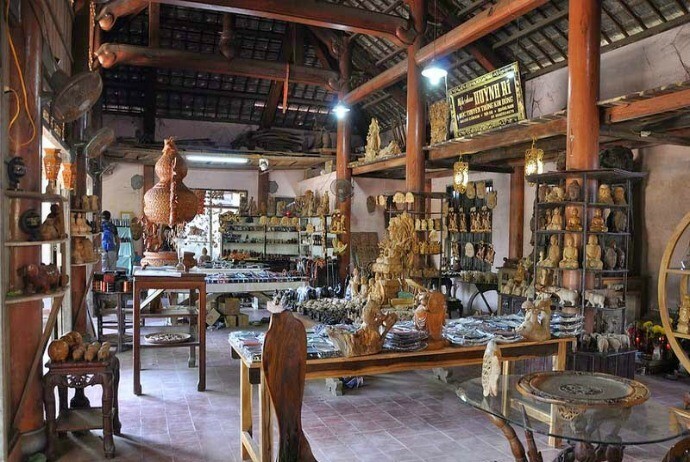 Thus, this village is more of a live museum, and holds precious documentation resources for scientists studying about traditional pottery in Vietnam as well as Southeast Asia. Cu Lao Cham consists of 7 small islands, which are Hon Lao (Hòn Lao), Hon Kho Me (Hòn Khô Mẹ), Hon Kho Con (Hòn Khô Con), Hon Tai (Hòn Tai), Hon Dai (Hòn Dài), Hon Mo (Hòn Mồ), Hon La (Hòn Lá), Hon Ong (Hòn Ông). 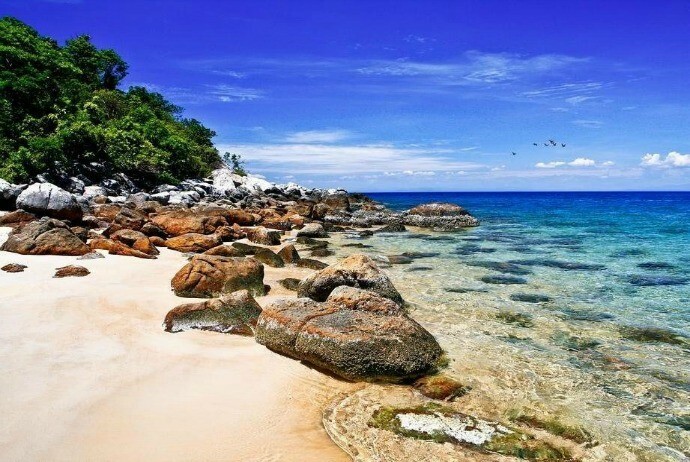 Cu Lao Cham (Cù Lao Chàm) outstands when it comes to the biodiversity of natural forests, beautiful beaches, coral reefs and many species of valuable fisheries. If you go in the form of backpacking, you can experience the feeling of the night in Cu Lao Cham, just rent a tent (50,000 VND) and pay the fee for an overnight stay of VND 20,000. When bathing in Cu Lao Cham, you should be careful of translucent jellyfish, touching them will cause rashes which are quite annoying. Location: Tan Hiep Commune, Hoi An, about 18 km to the east from Cua Dai (Cửa Đại) beach, about 30 minutes by speedboat from Cua Dai port or about 2 hours by wooden boat from Bach Dang (Bạch Đằng) pier. 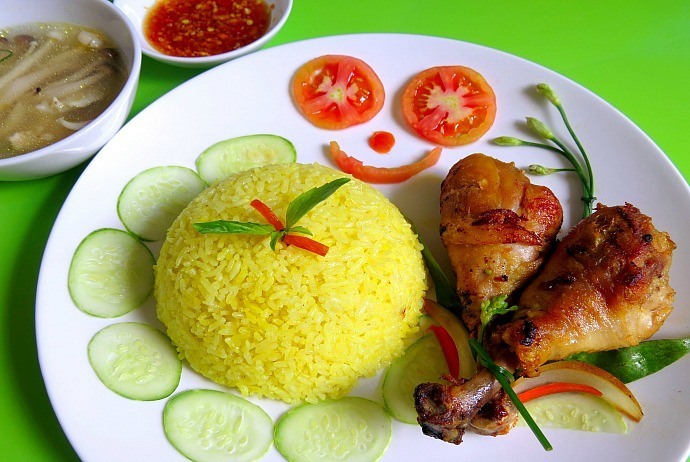 With all of the clever and meticulous in the way of processing, Hoi An people created a dish of chicken rice enough to create a special name for its self: Pho Hoi chicken rice. This dish is eaten with onions, papaya, Tra Que herbs. Also, there is a bowl of soup mixture, including chicken heart, liver and kidneys, increasing the attractive feature of the dish. 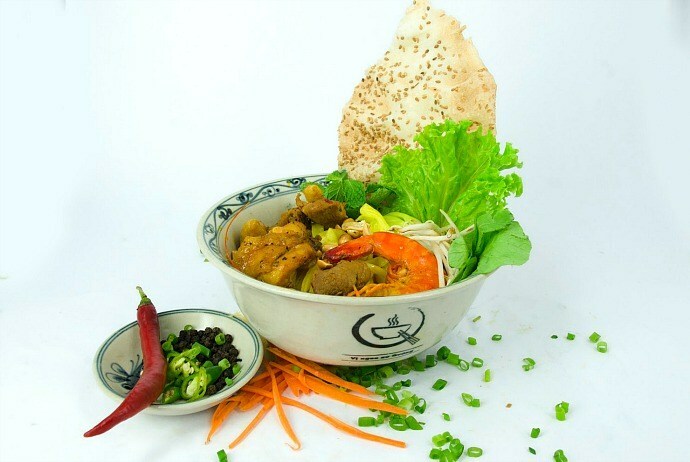 Many longtime residents said that Cao Lau (Cao Lầu) appeared in Hoi An since the 17th century so that this dish was strongly affected by Chinese cuisine. However, Hoi An’s Cao Lau still has its exclusive feature and just Hoi An offers the right dish with high quality. Address: it is easy to find Cao Lau in Hoi An, from the roadside vendors to restaurants on Tran Phu (Trần Phú) Street, the most famous is Ba Be (Bà Bé), Trung Bac (Trung Bắc) restaurants. 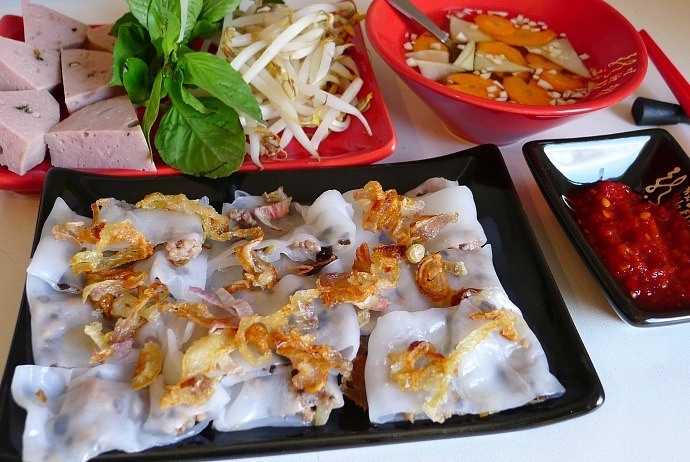 Dumplings and banh vac (Bánh Vạc) are two types of cake having similar ingredients, often accompanied with each other on a plate. Banh Vac is made from the crushed ground shrimp mixed with pepper, garlic, onions, lemongrass along with esoteric species. The stuffing of banh vac is made from pork, mushrooms, thinly sliced green onions fried with secret spices. Maybe, this spice part is what makes this dish unique in Hoi An. Address: Bong Hong Trang (Bông Hồng Trắng) restaurant on Nhi Trung (Nhị Trưng) street. Here, you can see firsthand the process of cake making. This is a very impressive dish in Hoi An. The crispy piece of cake is served with sautéed mussels will bring to you an unforgettable eating experience. 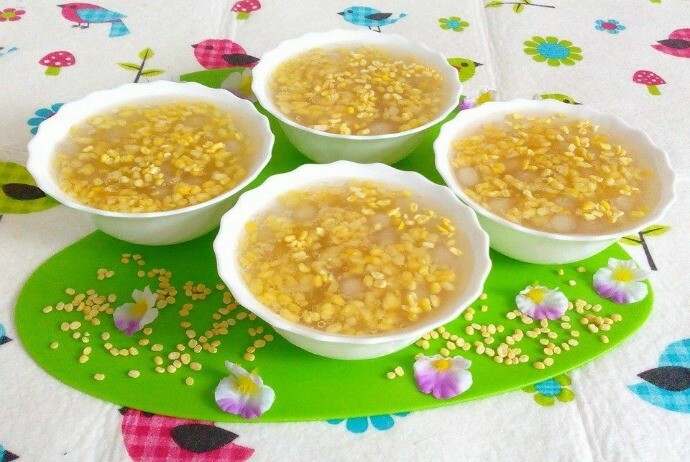 Che Bap (Chè Bắp) – a rustic dish becomes famous in Hoi An because it is made from Cam Nam corn which is renowned in Hoi An. This dish is sweet, fragrant with the fragrance of the newly cracked corn. Unlike “chè” in Southern area, Che bap in Hoi An is not cooked with coconut milk so it has the original flavor of corn. Just when you eat, you sprinkle the coconut milk on top to increase the fat taste. To make “banh beo”, people choose the delicious type of rice; the insides are pork and shrimp. When eating “banh beo”, it is necessary to use “bamboo knife”, this is a blade-shaped bamboo rod. This type of eating also triggers the curiosity of guests. It also differentiates “banh beo” and other delicious Hoi An dishes made from rice. Apparently, Quang noodles is almost like Cao Lau (Cao Lầu), but just tasting one times, you will see that these are two different dishes. Quang noodles are often served with shrimp, pork and quail eggs. All of the spices are infused. When you eat, crispy rice paper and vegetables are indispensible. Address: Mrs. Minh (Bà Minh) restaurant, Cam Ha (Cẩm Hà) zone or in Hoi An market. There are different types of wonton: soup wonton, noodle wonton, fried wonton, each is also divided into chicken, pork and shrimp. Empirically, chicken and pork wonton are easy to eat while shrimp wonton is sweeter and more aromatic and the fried wonton is a little bit sick. 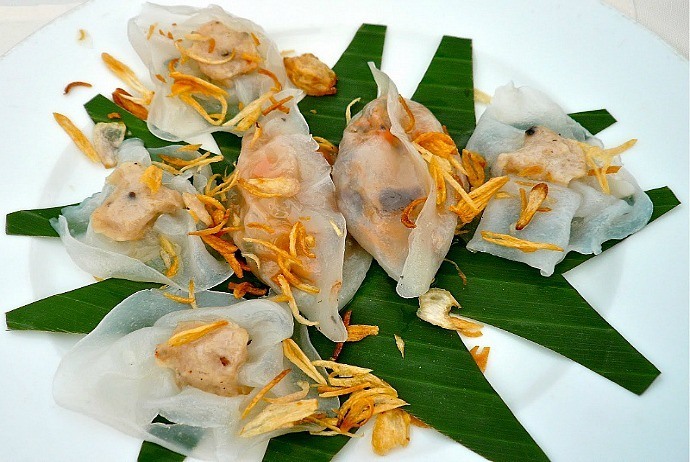 Also similar to Thanh Tri (Thanh Trì) rolls in Hanoi, but instead of the thin rice paper served with black mushrooms inside, the rice paper in Hoi An also has shrimp. When eating, it is added fragrant onion and pork fat, served with spring rolls. The Vietnamese crepe in Hoi An, also known in Vietnamese as banh xeo, is genuine. The main ingredients of this dish are shrimp and pork, in addition to rice. To make banh xèo, people have to sit around the fire constantly, so the rainy season from October to December is very suitable for making this dish in Hoi An. 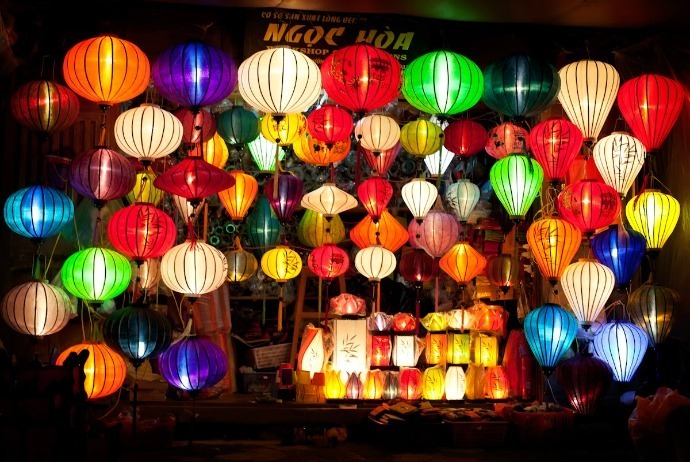 When it comes to shopping in Hoi An, it will be a mistake if not mentioning to Hoi An lanterns. Hoi An lanterns are made quite nice, lightweight and collapsible, so they are suited as souvenirs for travelers to bring home. 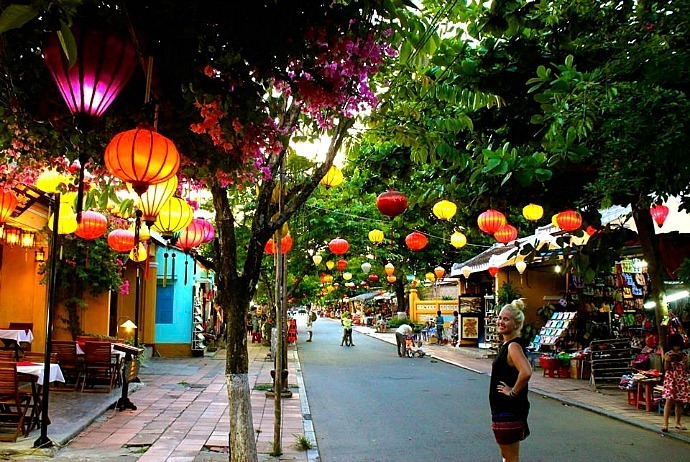 You can find lanterns on Tran Phu or Le Loi (Lê Lợi) Street with the affordable price. Ordering handmade clothes in Hoi An is cheap, pretty and fast. Within just a few hours, the sewers will finish your order. If you cannot wait, just simply leave your measures and address, the shop will send the product to your place. There are some famous clothing stores in Hoi An, which are Thu Thuy (Thu Thuỷ) shop (60 Le Loi (Lê Lợi) street), Yaly (no.358 Nguyen Duy Hieu (Nguyễn Duy Hiệu) Street), A Dong Silk (no.40 Le Loi (Lê Lợi) street), Bao Khanh (Bảo Khánh) (no.101 Tran Hung Dao (Trần Hưng Đạo) street). Shoes in Hoi An is also quite various and beautiful. Many shops offer the service of making shoes as fast as clothing stores do. The type of cakes you can buy as a gift, such as banh in (bánh in), banh dau xanh (bánh đậu xanh), green beans, banh it la gai (bánh it lá gai). Chili sauce is the specialty of Hoi An with pungent scent. Hoi An is very interesting in the early morning, the streets is deserted, Hoi An people start their new day, no electric lights or busy sellers and buyers. You can walk at night in the corners of the purity old town in Hoi An. Every night, there is a cultural boat strolling around the river at Bach Dang (Bạch Đằng) wharf, serving folk concert. Restaurants and shops are always ready to serve you enthusiastically. So, you do not necessarily follow those people serving as an intermediary to go to the shopping places. 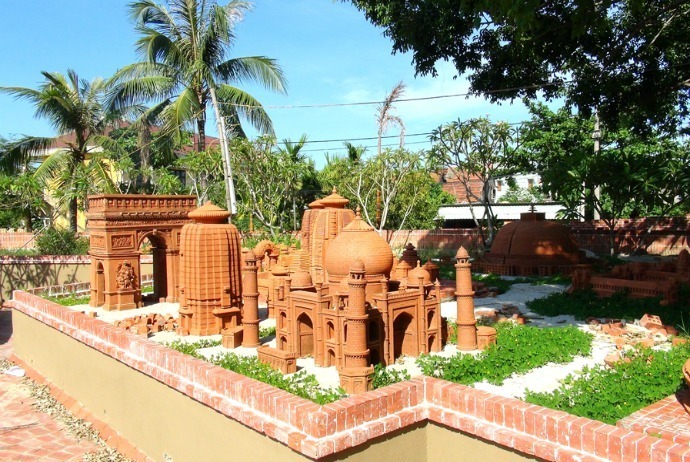 Where are the best places to stay in Hoi An? 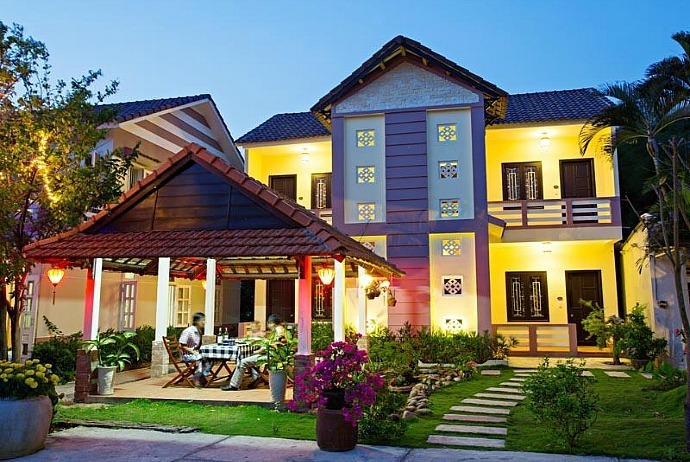 As a tourist city, especially attractive to foreign visitors, Hoi An is no shortage of hotel amenities. In the heart of the city, the price is quite high and the hotels are often full of booked rooms early. Guests should make reservations in advance at least 2 months to get good prices. During the peak season, if you book late, you can find a room in downtown, such as Huynh Thuc Khang (Huỳnh Thúc Kháng) Street, near the bus station, or Thai Phien Street. 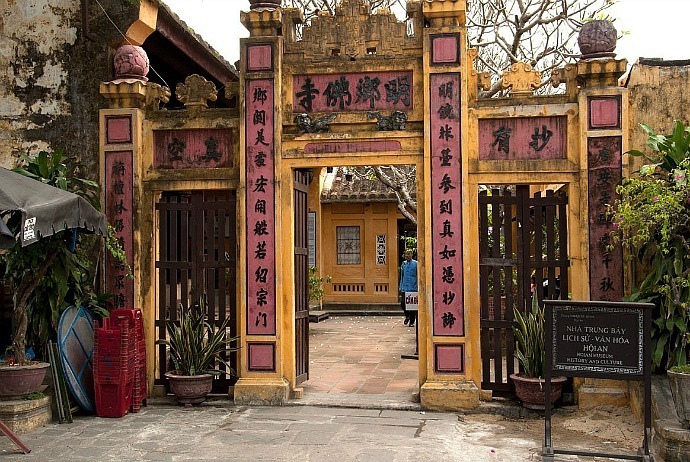 About 5km to the east away from the center of Hoi An ancient town, Cua Dai (Cửa Đại) has long been known as the gateway of a busy commercial port with the most beautiful scenery of the region. 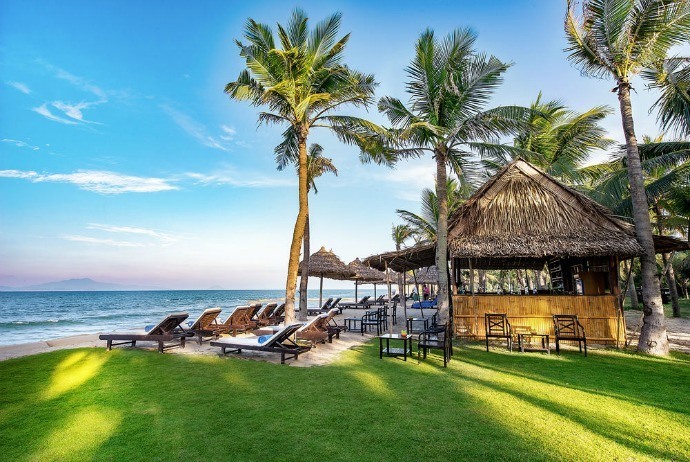 If the ancient town of Hoi An is quiet, then Cua Dai, or An Bang (An Bằng) beach remains young and lively, appealing tourists and couples to go to take the wedding photographs, thanks to its wild and fresh beauty and the wide-open space. Hoi An Ancient Town still preserved almost intact a group of architectural relics including ancient residential buildings, assembly halls, temples, shrines, wells, bridges, churches, docks, markets … the narrow horizontal streets run along form the checkerboard squares, covered with ancient moss color, making your photos really impressive. 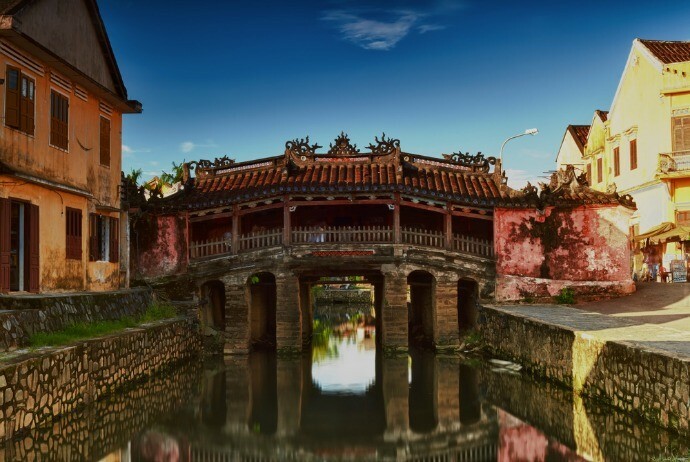 Cau Bridge – a Hoi An symbol was built in the late 16th century and is often called the Japanese bridge. In the middle of the bridge, there is a small temple worshipping Huyen Thien Dai De (Huyền Thiên Đại Đế). Cau Bridge has quite unique roof along with the texture, decoration features showing harmony between the architectural styles of Japan, Vietnam, China, and Western area. Due to the unique architecture of Cau Bridge, a lot of travelers visiting Hoi An all want to preserve the great images of this fascinating destination. Hoai River is a tributary of the Thu Bon River running through Hoi An. With local people, in particular, and tourists, in general, this river is an inseparable symbol of the ancient town. Besides taking pictures at Hoai River, you can also drop flower on the boat and save the image of the shimmering river like a fairy tale on the full moon day. Lantern is a very distinct feature of Hoi An. Hoi An has beautiful silk, it is used to form the colorful lanterns, making the city at night more brilliant and shimmering. In the evening, along the banks of the Hoai (Hoài) River, you will find many young people taking pictures beside the shimmering, colorful lanterns.